New Geotrigger Service allows developers to make their own iOS and Android apps geoaware. Engage customers with personalized content or deals the moment they enter a store. The Geotrigger Service includes a set of battery management tools. A mobile app using the Geotrigger Service can let you know when you're near interesting places you might not notice or know about, like the world's smallest park. When people think of location-based mobile apps, it’s often apps like Foursquare or Yelp, or tools for navigation. Esri’s new Geotrigger Service enables you to bring your location data to life with location-based alerts for the devices in your organization or user base. The Geotrigger Service includes a set of battery management tools, meaning you can add persistent location awareness to your apps without the battery drain. The Geotrigger Service—now available in beta in ArcGIS for Developers—allows you to make your iOS and Android apps geoaware, send relevant push notifications based on your organization or user’s location, and collect business intelligence. The Geotrigger Service is completely cloud based and does not require an ArcGIS for Server solution. Allow people to leave notes at places for others to receive upon arrival. Inform tourists about interesting places as they explore your city, theme park, etc. Monitor field-workers’ locations in real time and automatically alert them if they get too close to a danger zone. Send a message to prospective home buyers when they’re near a home that matches their search criterion. Prevent users from accessing certain content when not in a specific place. Optimize customer service by notifying employees when a customer who just ordered something in your mobile app arrives at your store. The notification as it appears on an iPhone (front) and Android (back). How Does the Geotrigger Service Work? Once developers include the Geotrigger SDK in their iOS and/or Android app, it will be able to send and receive location data from a cloud-based streaming server in real time. Then, developers can define points or polygons of interest using the Geotrigger API and set the action they want to happen when someone enters the “trigger zone”—whether that’s to send a push notification message; log the time until they leave the area; or post a callback to an external service, such as a customer relationship management system. Why Would a Mobile Developer Want to Use the Geotrigger SDKs? First, the Geotrigger SDKs make it easier for developers to build geoaware iOS and Android apps. Doing location work in iOS and Android is very different, and the Geotrigger SDKs make it more consistent and fast for developers to make their apps for both mobile platforms. The Geotrigger SDKs are built on top of core iOS and Android location services, making the services easier and more complementary to work with. Second, the Geotrigger SDKs make apps as battery efficient as possible without the developer having to do any work beyond choosing one of four tracking modes in the Geotrigger SDK. 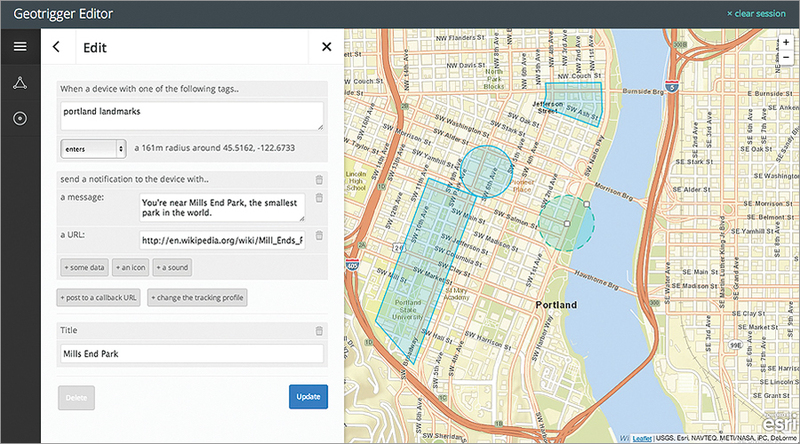 How Does the Geotrigger SDK Integrate with ArcGIS Online for Developers? The Geotrigger API understands Esri JSON, which is a way to store and communicate geometry information between Esri services. There are also extra tools that can import features from services into trigger areas. An ArcGIS for Developers account will give you access to the Geotrigger Service, along with the many other tools we have for location-minded developers, such as geocoding, context, directions, and advanced routing. The Geotrigger Service will come out of beta in late February 2014. Until then, it will be free to use, and we’ll publish pricing as soon as it’s available. We will continue to improve the Geotrigger Service based on feedback from the developers who use it during the beta period. You are invited to try out the beta of the Geotrigger Service and bring your data to life in a completely new way. For more information on the Geotrigger Service or to start using it, visit developers.arcgis.com/en/geotrigger-service.